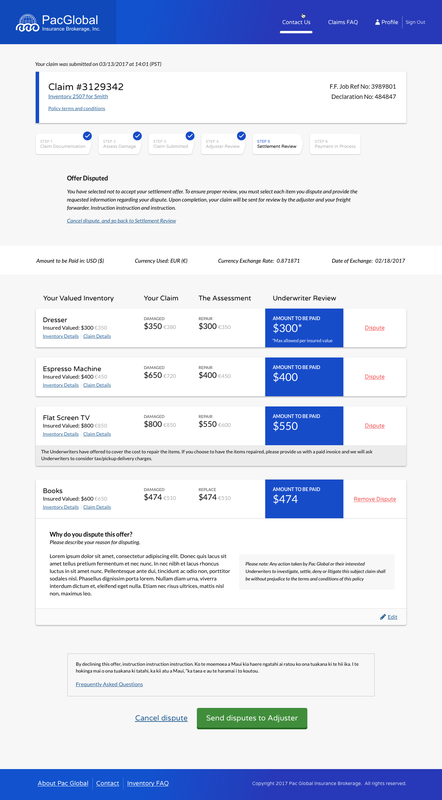 A redesigned insurance claims process that increased customer transparency while reducing dependency on email. Pac Global is an international insurance brokerage that provides a comprehensive insurance program for international moves. The existing communication system relied heavily on email between shippers, freight companies, and their internal team to resolve claims. This manual process proved increasingly frustrating for all parties involved. Our challenge was to create a transparent online workflow that tracked every step in an insurance claim. This would reduce dependency on email, track notes and actions more clearly, and save time on back-and-forth communication. Through discussions on Pac Global’s existing insurance claim process, we discovered a path to a seamless solution that gives customers access to their claim information every step of the way. We learned about Pac Global’s multi-step process for evaluating insurance claims: verifying values, gathering proof of any damage, working with outside agencies when necessary, comparing repair and replacement costs, and ultimately deciding the result of the claim. 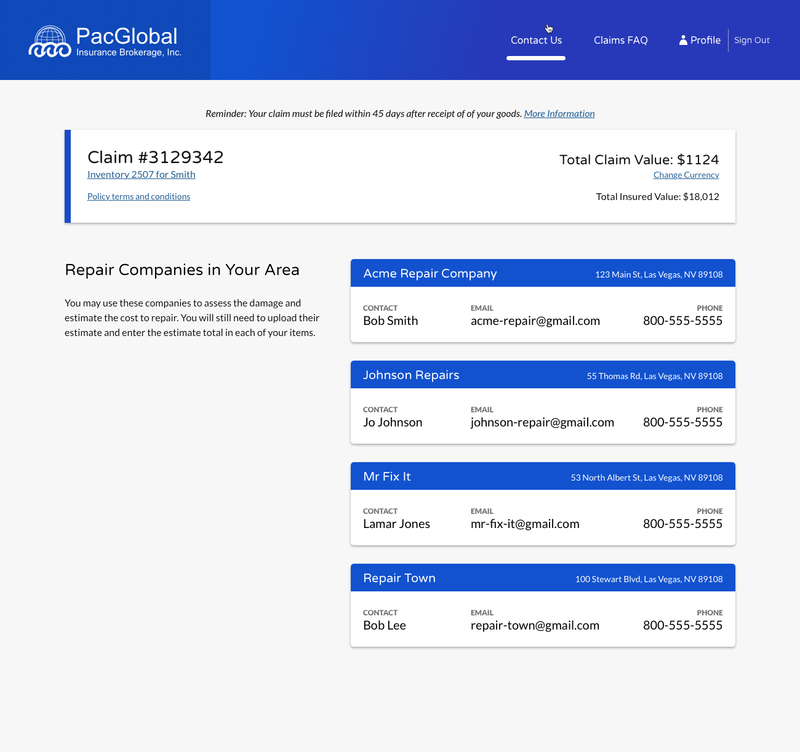 Through conversations with Pac Global’s claims team, our designers were able to mock up a workflow that accomplished this complex process, while providing as much transparency and accountability for all parties involved in insurance claims. After creating, discussing, and revising these workflows in collaboration with Pac Global, our development team implemented this new system using React.js and Ruby on Rails. This new system informs every user to the status, dependencies, and roadblocks of their claim. Important dates and information are clearly provided to the customer. Helpful tools allow users to upload documents, files, and images to support the claim. And all changes and progress on a claim are tracked within the admin application, for a complete activity history. The positive results of this new claims tool are evident for both Pac Global’s internal admin team and their end users. For customers, the increased transparency in the claims process gives them assurance that they are working with a trustworthy insurance brokerage. They won’t have to waste time on endless emails and phone calls for their claim. Instead, they’re able to clearly see the status of their claim item, who is handling it, and what the next steps will be. For Pac Global, their admins are more clearly able to keep track of their communications with customers, and the status of each individual claim they’re working on. This increased accountability and transparency ease the relationship between Pac Global, freight forwarders, and the claimant, while saving administrative time with significantly reduced email communication.